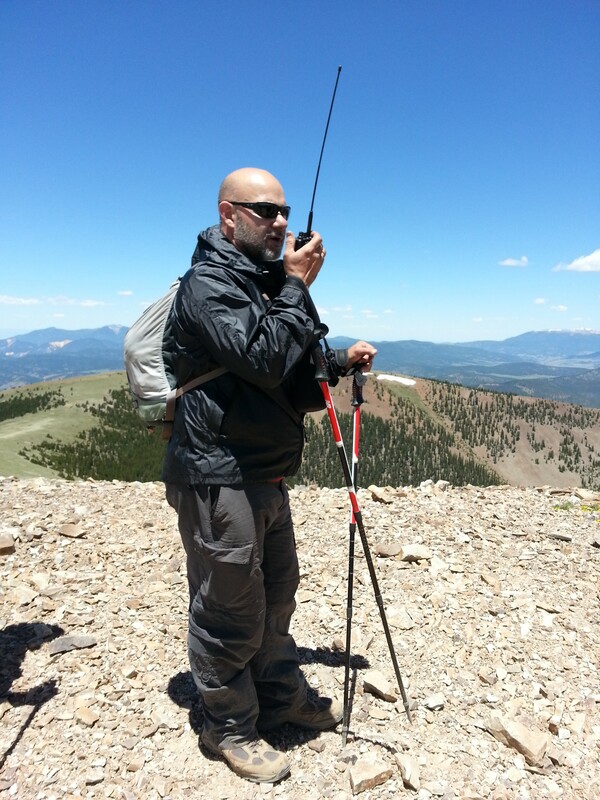 Bud Turner, N1ROE, provided this great report on his use of ham radio while on a Philmont trek with his troop. Hopefully this will provide insight for your Philmont trek or other high adventure activities. Bud Turner, N1ROE, on Mount Baldy at Philmont Scout Ranch. Two weeks ago Troop 164 finished our first trek at Philmont Scout Ranch. It was all at once exhilarating and tiring, exciting and boring, awesome and annoying. The hiking was good and the food was ok, but the experiences will never be forgotten. Just like any scout troop, we completed several preparation hikes. After our first hike in the Angeles National Forest without mobile phone reception I thought about purchasing an HT. I was able to cut the weight in my backpack by about 20 pounds and I decided I could afford 370 grams of extra weight. So, I bought a Yaesu FT-60. Living in Southern California it’s easy to always be within reach of a VHF or UHF repeater. I figured having a radio would at least be a back-up form of emergency communications and at most a fun addition to our hours on the trail. Lugging it around proved not too difficult so I made the decision to bring it to Philmont. There are very limited reports of hams using their radios on an actual trek. I had also read that Philmont discourages the use of handheld electronics which included radios. However, this proved to be false. Before heading out on the trail, our crew’s Ranger performed a thorough review of all the gear I planned to take along. During our gear shake-down I showed the radio to our Ranger who simply shrugged and said, “Whatever. If you want to carry it, that’s up to you.” I’m not sure if a scout would have gotten the same response, but the support of the advisors should help. After our initial issue of four days’ worth of food my pack weight had increased by 10 pounds. I was a little worried about weight so I didn’t bring my spare battery. In hindsight I should have brought it since my battery died about day 7 or 8. In the big picture, the spare battery probably would not have made much difference. In regards to radio performance, I was very pleased with the Yaesu FT-60. It’s a very rugged rig and took quite a beating. I would often remove my backpack and forget to remove the radio. Still attached to my pack, it would often end up in the dirt with my pack on top. It was dropped more times than I can count, whacked against trees and even dropped in a shallow creek. A wet bandana was all I used to wipe it clean and it still works great. I swapped the supplied rubber duck for an aftermarket Diamond SRH77CA hi-gain whip antenna. I mostly carried the radio on my hip when it was off. When switched on, I would carry it on my chest strap, but the longer antenna would often whack me in the side of the face. An external speaker mic would have made it more comfortable. After a day or two on the trail I became adept at removing the radio from my waist without too much effort. I also brought along my iPhone 5s with the Repeater Book app. I like this app because it does not require a data connection. Since the repeater database is downloaded to your phone, you need only take your phone out of airplane mode for a few seconds to get a GPS location. Once the app loads the list of nearby repeaters you can place your phone back in airplane mode and the repeater list remains visible. During the trek, I was able to receive a handful of repeaters on 2m & 70cm. However, with only 5 watts output I wasn’t always able to get into them. Several times I was able to key up the repeater but other stations reported that they heard no audio, only noise. Our trek had several hikes which took us up and down canyons and I suspected the high terrain on either side had something to do with my ability to reach some of the local machines. Our day hike to the top of Mt. Baldy proved that the terrain was indeed the culprit. I reached several repeaters on the Mega-Link System and even attempted a few simplex contacts. It’s very windy and cold on the peak so we didn’t spend much time at the top. My T-Mobile service was the best performer on the trail, but at one point we had been without mobile phone service for several days. I knew the families back home were anxious to hear from us since I had been updating my Twitter feed several times a day using our troop’s hashtag. Luckily, I was able to reach a repeater in Raton, NM. I passed some message traffic to a local Ham with a Twitter account who updated our families using our hashtag. That was a cool use of amateur radio, but the operator didn’t include his call sign in the Tweet and I didn’t write it down, so to this day he remains anonymous. The highlight was on our first day of the trek. I contacted another scout troop that was also on a trek and had a brief QSO with an adult advisor via a local repeater. I was hoping it was indicative of the many contacts to come but sadly it was the only scout contact I made. I’m hopeful more troops bring radios providing increased opportunities for local contacts while on the trail. I carried the radio around base camp before we left and after we returned from our trek. It seemed to generate quite a bit of interest. I think a Philmont repeater or two and an aggressive ad campaign would entice more hams to bring radios and connect with troops on the trail. Most of the staff camps have commercial radios for communicating with base camp. I would like to think a ham radio shack in the back country at one of the staff camps would be a fun way for the boys to connect with the outside world during a trek. Bottom line – it was worth bringing the radio. It would be great to see more troops with ham radios in the back country and maybe even a nightly or weekly radio net.